You want to see rhinos on your holiday? Vacation to Kruger National Park, South Africa-home to 90% of the world’s remaining rhino. “At that moment everybody got very emotional and the rhino disappeared back into the bush. It was at that moment we realised we were seeing something that has never happened before. It’s very emotional for all of us. I couldn’t stop crying. 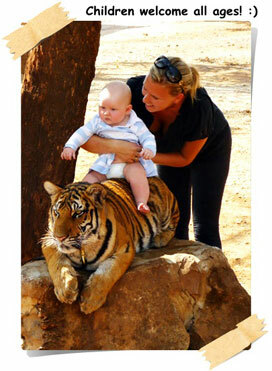 You can’t stop crying when you see something that outrageous”, said Louis Dillen, one of the tourists on the safari. Horrible, heartbreaking, devastating to bear witness to…BUT is there a bright side to this brutality? 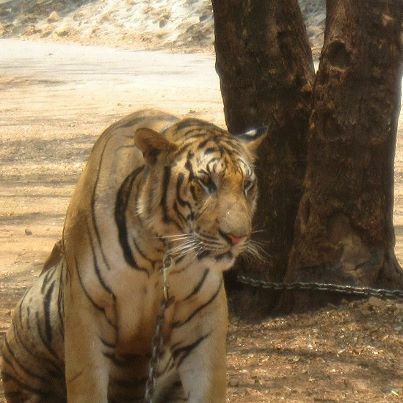 With poaching rearing its ugly head directly in the face of tourists, especially one so closely connected in the political community, this is a wake-up call. If Kruger, or South Africa itself, wants to continue making profit from tourism, things Must change. Belgium is aware and watching, and after the photo went viral this past week, so is the rest of the world. Fresh off the London Summit on Wildlife Trafficking, where 50 countries attended to get serious about putting an end to illegal trafficking, this may be another push toward change. As horrific and haunting as this must have been, she is one of thousands who have been slaughtered over the last several years; 2-3 a day, every day. In 2014, there have been an additional 163 poachings so far (OSCAP). Things continue to get interesting in efforts to save the rhino. 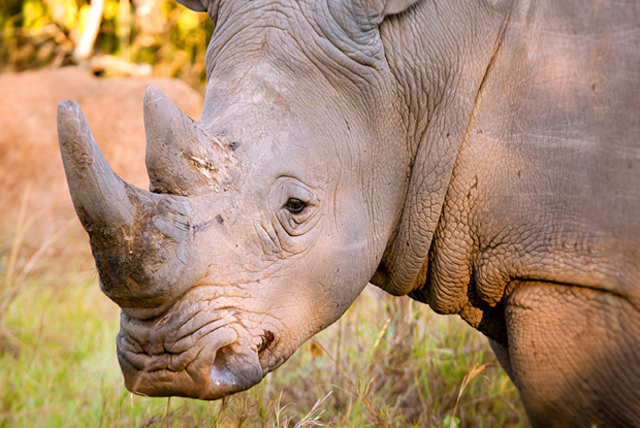 This time the South African government’s plan to aide in rhino conservation is to sell them. In the past two years, the Kruger National Park (home to the largest rhino population on the planet), has sold more than 170 white rhinos to private ranches across the country. 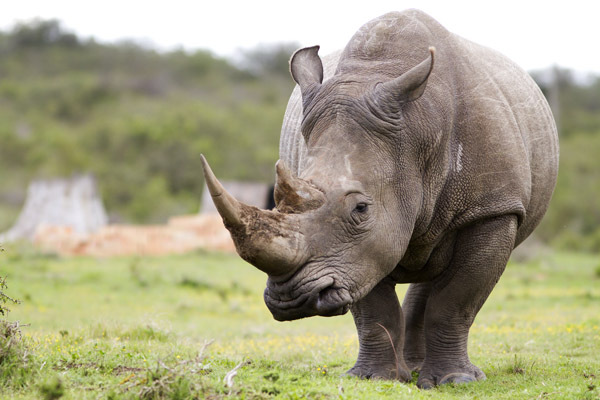 According to Edna Molewa, the Minister of Environmental Affairs, this is a necessary move to improve the white rhino population by establishing smaller groups in different ranches. In addition to preserving the species, this generates income for the Kruger National Park. 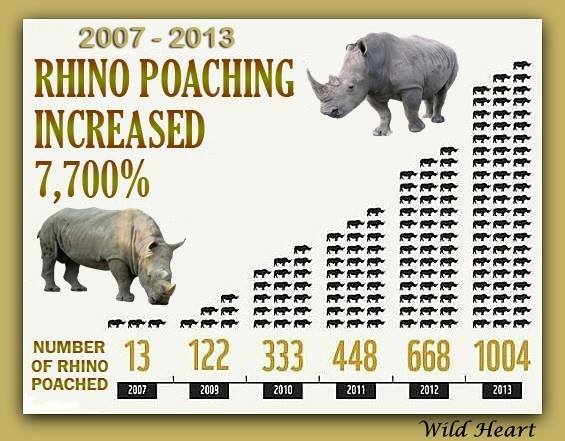 The current rhino death toll stands at 645 for 2013. The KNP accounts for 381 of them, despite help from the army, helicopters and drones. But isn’t a rhino living on a ranch just as vulnerable to poaching as one living in the park? In addition, how can the motives of ranchers be trusted, especially considering they are the ones who support legalizing the trade in order to turn a profit? Most importantly-WHO is buying the rhino? Urgent: Crushing Blow to the Rhino! 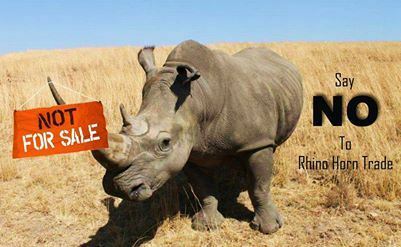 SOUTH AFRICA DOES NOT WANT TO SAVE THE RHINO!! 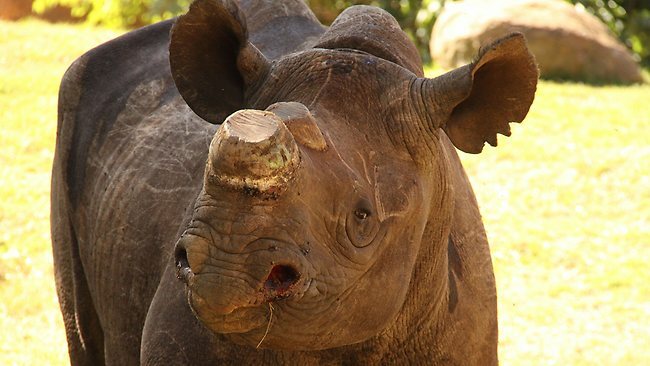 Durban – The government has baulked at the massive cost of dehorning up to 10 000 rhinos to slow down the rate of poaching – but is looking into a separate plan to trade rhino horn on the Johannesburg Stock Exchange. It has also emerged that South Africa may apply for special permission to hold two rhino horn auctions within the next year, instead of waiting another three years for the next meeting of the Convention on International Trade in Endangered Species (Cites). Earlier this week, the Department of Environmental Affairs released the recommendations of the Rhino Issues Management (RIM) report which calls for the immediate dehorning of thousands of rhino in national parks. Written by former SA National Parks chief executive Mavuso Msimang, the report argues that dehorning large numbers of rhino would demonstrate South Africa’s international commitment to preserving the species from possible extinction due to the increase in rhino poaching over the past five years. Msimang noted that de-horning would be “extremely costly” and would have to be repeated every two to three years, as horns regrew at the rate of about 5cm every year. “To dehorn 10 000 rhino at a rate of eight rhino per day will take approximately 1 000 days (almost three years) and cost in the region of R84 million,” says the report, noting that it costs about R8 000 to dehorn each rhino, to take DNA samples and insert microchips into the horn. 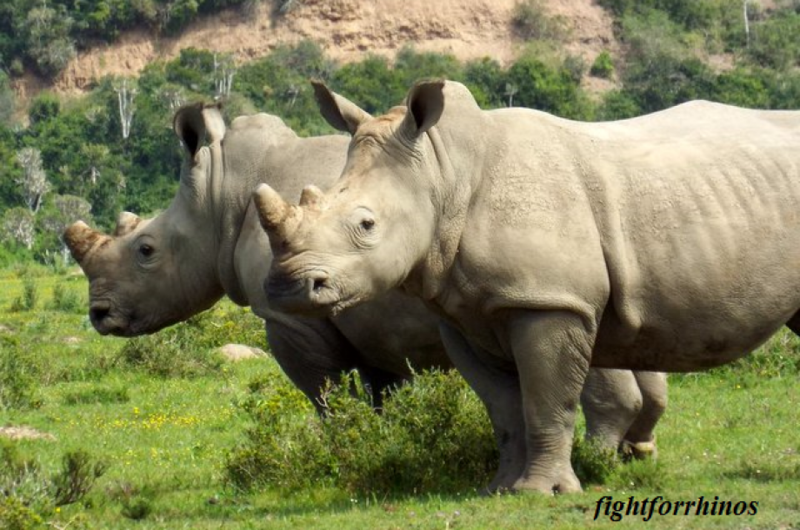 Despite record poaching levels, South Africa still has about 19 000 white rhino and 2 000 black rhino (which together account for nearly 75 percent of the global rhino population or 83 percent of the African rhino population). The report acknowledges that male and female rhino use their horns for defence, while black rhino sometimes use their front horns to pull down branches to browse – but suggests that some of the potential problems could be avoided if all males in the same area were dehorned simultaneously. However, the government made it clear this week that de-horning was a non-starter for now – except in smaller reserves. Citing the results of a specialist study, senior Department of Environmental Affairs official Thea Carroll said de-horning was seen as a viable option for only small rhino populations because of the major and repeated expenses of dehorning large numbers of rhino in expansive areas such as Kruger National Park or Hluhluwe-Imfolozi Park. In a separate recommendation, Msimang urged the government to consider opening a rhino trading bourse possibly linked to the JSE. The bourse could be run by a board of directors or a trust drawn from the public/private sector and civil society, generating income to offset the costs of keeping and protecting rhinos. In her response, Carroll did not rule out this suggestion completely and said the feasibility would have to be investigated in collaboration with the Treasury and other relevant organisations. Nevertheless, it seems highly unlikely that investors could be persuaded to trade horns until Cites makes a ruling on South Africa’s controversial proposal to end the 36-year-old world ban on international rhino product trading. South Africa is expected to submit a formal proposal to the next Cites meeting, which will be held in South Africa in 2016. 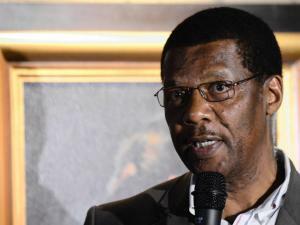 But Msimang’s report, based on a series of workshops and meetings held last year, noted that South Africa might not have to wait so long to submit its trading proposal. He said that although such proposals were normally considered at Cites meetings held every three years, there was a special provision under article 27 of the Cites rules which allowed for interim applications to be made in-between these triennial meetings. 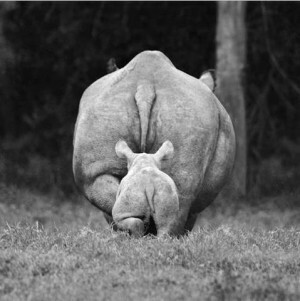 *93% of the existing rhinos reside in South Africa and naturally this is where the greatest poaching problem exists. 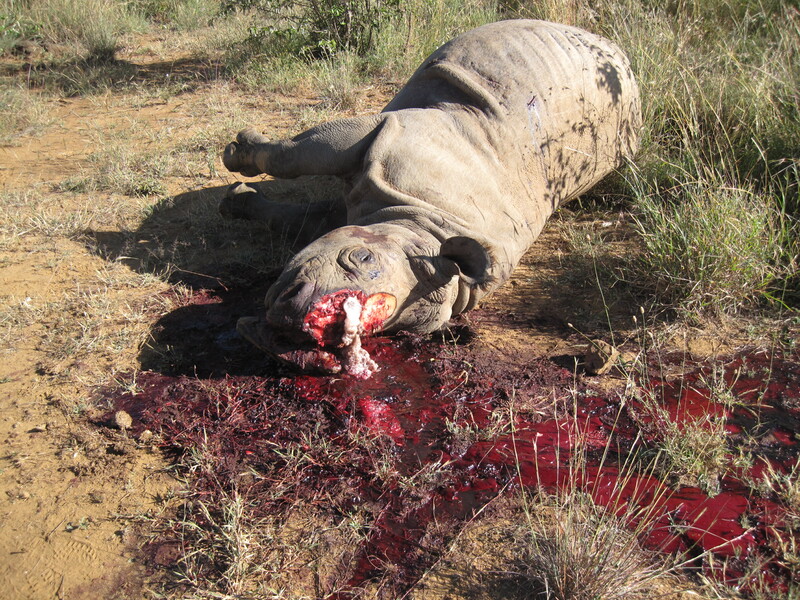 *On average 3 rhino die every day in South Africa from poaching. According to the Wildlife and Environment Society of South Africa, poaching has cost the country a financial loss of $22 million USD just last year alone. So what is South Africa doing to combat this? There are “stiffer” penalties in place now for confirmed rhino poachers. In S. Africa, kill a rhino and get 10 years jail time and/or a $110,000 USD fine. That is IF you get caught, and even then only IF there is substantial evidence. Considering a single rhino horn can fetch $300,000 on the Asian market, the fine seems worth the risk to a would-be poacher. 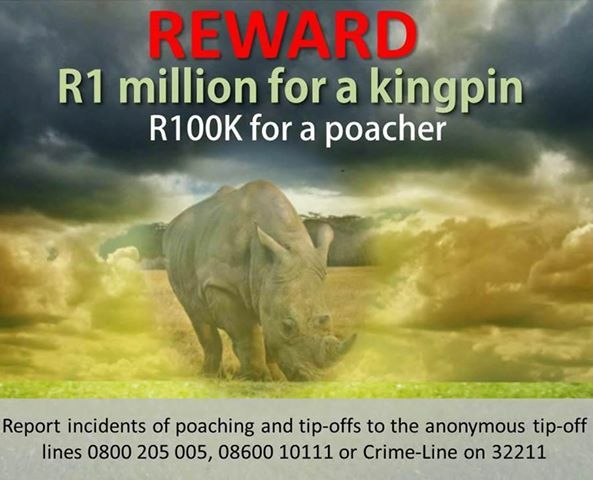 In addition SanParks (South African National Parks) is offering rewards of $10,000 USD for information which could lead to the arrest of a poacher and $100,000 if it’s information that could bust a syndicate. SanParks also introduced a reward system for informants. For reliable and steady information, meat, rations, or prepaid cell phone vouchers are given as reward. But this hasn’t seemed to help curb poaching. De-horning hasn’t been as effective as it once may have been, offenders are hunting down the animals for even the small nub that is left. Apparently ANY horn is better than none. The South African National Defence Force has deployed 265 soldiers to Kruger National Park. The Army is backing up the overwhelmed park rangers in the war on poaching. According to the SA Department of Defence, this IS working. 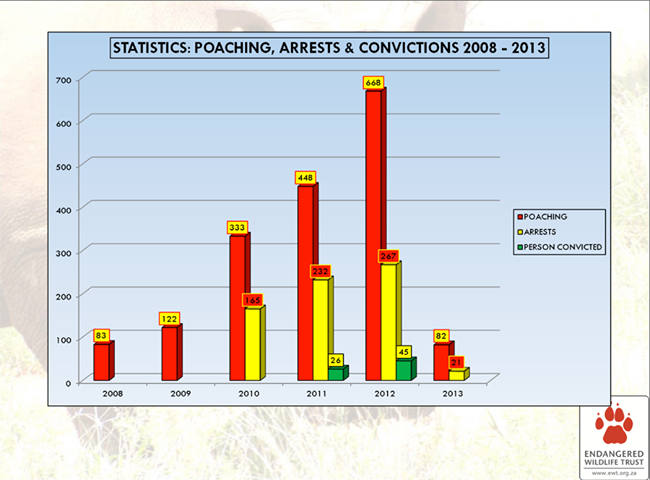 Within 3 months after their arrival, poaching incidents have dropped from 40 in March to just 2 in June. But although there were 56 arrests in 2 months, the dockets were conveniently “lost” and the suspects were released. This only points at corruption within the justice system. So the country is looking at the desperate measure of legalizing the trade of rhino horn in a one-off sale of the country’s stockpile In order to do this, approval is needed by CITES (The Convention on International Trade in Endangered Species of Wild Floral and Fauna) to lift the 30 year ban on rhino horn trade. CITES (which is like the UN for international wildlife) needs to reach a consensus through majority vote, which will take place at the next meeting in 2016. Reminiscent of pre-election propaganda, the battle to win public opinion is beginning. Both the Department of Water and Environmental Affairs and the private rhino farmers are convinced this is the best option. Their argument is that by flooding the market with horn (which coincidentally the private owners have been storing up for years in preparation for a hopeful gold mine), it will bring down the demand. This is at best, a flawed notion at conservation, at worst, a dangerous scheme to make the almighty dollar. Remember the elephants: In 1989 a similar decision was made by CITES to lift the ban on ivory trade. Did the elephants benefit? There was a marked rise in the level of poaching soon after. In the 1980s the African elephant population was 600,000. Today there are approximately 400,000. Poaching elephants for their tusks, particularly in China, is rampant and there’s no end in sight. Recently there was even a government accredited ivory trader in China convicted in part of an illegal ivory smuggling ring! Mathematics: Let’s look at the numbers. There are approximately 1.3 billion people in China, 87 million people in Vietnam, 69 million in Thailand, and 6.2 million in Laos. Even if we assume only a sixteenth of the population uses horn, that’s 92 million people. Yet there are only approximately 24,000 rhino left in ALL of Africa. The thought for is that the horn is a renewable resource; it does grow back, but at a rate of 1-3 inches per year. Hardly sustainable. So a one time sale will only wet the appetite of an already insatiable Asian market. 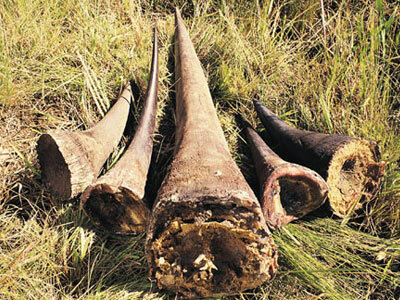 Common sense: Trade in horn is currently part of a lucrative illegal trade connected with international criminal syndicates, so by legalizing it, what message does it send? And does anyone really think that this will make the illegal trade magically stop? And even by doing it “only once”, it shows a willingness to sacrifice the rhino and weakness from the South African government. Ethics: Removing the horn from the rhino is unnecessary and ineffective. The horn does NOT have medicinal value. Therefore by making this legitimate, it sends the false notion that it indeed should be a valued commodity, and that it’s acceptable to wantonly strip animals of their parts. Ban Hunting: It is absurd that hunting of these animals is even allowed. It is only by permit, but considering the country can’t control poaching/hunting in the illegal form, it shouldn’t be an option until it can be better controlled. Lay down the law: Even when the anti-poaching units fulfill their jobs, justice needs to be served. The reward for the horn needs to be met with an equally hefty punishment when caught. A slap on the wrist undermines the APUs and does absolutely nothing to deter them from doing it again. When poachers walk out of court smiling, something is very wrong. Government: Have the WILL to enforce this. It is essential for the government, including the President to see the urgency of the rhino crisis, and truly want to make it a priority. Oversee the justice system, weed out the corrupt parties. 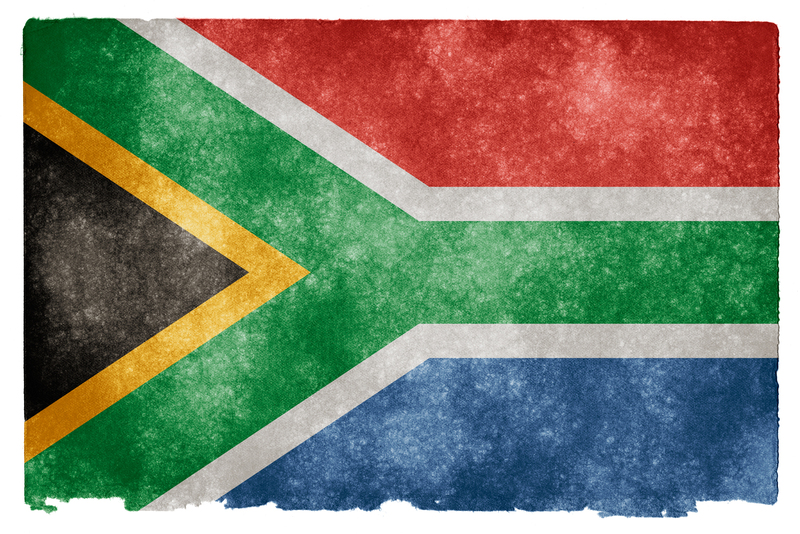 South Africa needs to recognize their reputation, economy and crime level are seriously jeopardized. Send a clear and concise message this will not be tolerated. International Cooperation: Maybe the most frustrating part of the horn trade is the easily available market on cyberspace. One of the most prevalent methods of international trafficking is through the internet. Although cyberspace easily facilitates illegal activities, it also makes for opportunities and avenues for monitoring and responding to trade activities. This requires a different kind of policing. TRAFFIC (the Wildlife Trade Monitoring Network) needs to continuously work closely with the responsible parties in the justice system. South Africa has its hands full. The efforts of drones, tactics, toughening penalties and employing military are commendable. But whether CITES overturns the trade ban or not, it is imperative for the government to get serious and weed out the corruption. 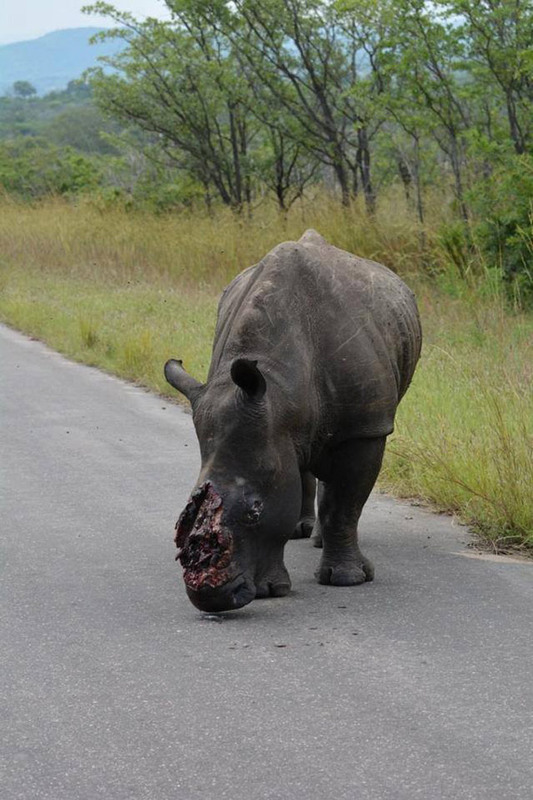 Without follow-through, nothing will work and ultimately our rhino will become extinct. Don’t let bureaucracy and corruption stifle conservation South Africa. Poaching is the ultimate crisis threatening the rhino and elephant. But when it comes to finding a solution to the problem, there are more questions than answers. The great debate is whether or not to legalize the trade of the horns and tusks. *Proponents believe legalizing would essentially take the control of trade away from the criminals by flooding the market, it would reduce the incentives for poachers. *It would give a tangible monetary value to the life of the rhino, thus increasing the incentive to keep them alive and cared for. *There would be no need for culling or trophy hunting, as every life would have value. *Nothing else is working, so it’s worth a try. *The argument against is that since the current ban isn’t being well policed, legal trade wouldn’t be either. Corruption and laundering of the illegal horn will continue. Illegal trade will Always undercut legal trade as poaching is cheaper than the costs of National Parks. *CITES (Convention on International Trade of Endangered Species) would demand proof of where the horn was obtained, and many of the current stockpiles contain horns of unknown origin, thus making them unsellable. Therefore the stockpile is not as abundant as people may think. *There are only approximately 28,000 rhinos on the planet, yet the potential Asian market of 1.5 billion users creates an issue of not enough supply to keep up with the demand. Although the horn is renewable, it takes approximately 3 years for it to regrow, not quick enough to satiate the Asian desire for it. *Lastly, it’s counterproductive to educate the public that the rhino horn as medicine is a myth, while agreeing to sell it. So what’s the solution? People on both sides agree it’s a rocky road, not knowing what effect it could have. 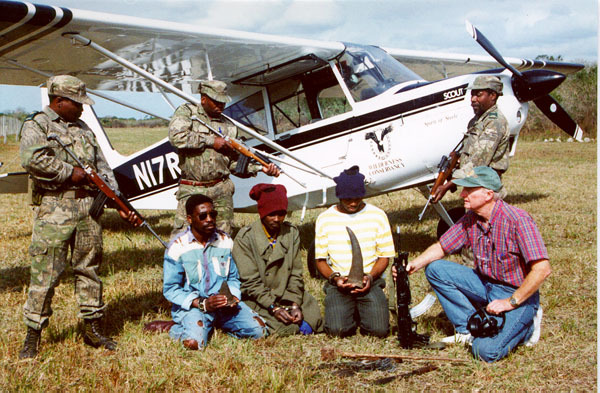 In the meanwhile, rhino farmers continue to collect their rhinos’ horns and governments sit on stockpiles of confiscated horns, anticipating the day when profit can be made. Interesting that the rhino is so “fortunate” to be able to give us all this opportunity for debate. The sharks whose fins are being sliced off cannot regrow them, the tigers whose body parts are taken, and the seals who are clubbed to death don’t have a chance. Let us hope we can come to a decision before it’s too late. While the debate wears on, I for one am searching for more information, for solid numbers, more definite answers. Where is the balance between appeasing the people and saving the rhino? Can we save each other?